Everyone’s well aware of the value of diamonds: they’re the hardest natural mineral on Earth, and thus are crucial for the creation of hundreds of products and materials we use every day. They’re also known for their sentimental value, a popular choice for fellow’s wooing their potential brides with dazzling rings, a lasting testament to their love. Our fantastic two-bedroom apartment in Tempe floor plans at Vela offer the same permanent comforts and amenities you’d come to find in the highest quality homes, much like the cleanest gems at your local jewelry market. 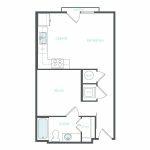 One of our lovely two-bedroom luxury floor plan, the B4, takes the analogy a step further thanks to its unique diamond-like shape. Sporting approximately 1,206 square feet of space, there’s more than enough elbow room for yourself along with a potential roommate or two, allowing you to express your creativity through your one-of-a-kind furniture and décor arrangements. Both bedrooms include the ability to hold plush king-sized mattresses – great for nighttime slumbers and afternoon naps, expansive walk-in closets for optimal outfit storage, and private bathrooms to bathe on your own schedule. The rooms also stand on opposite ends of the apartment, so your early bird or night owl companion doesn’t accidentally disrupt your rest. Share meals and laughter together in the open-concept kitchen, fully equipped and featuring a chef’s island perfect for snacking, along with extra dining space for a nice table. Finally, chillax after a long day together in the wide living room, or take a cool drink and admire the beautiful views from the huge private balcony. 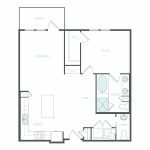 Find the diamond in the desert rough here at the Vela in one of our two-bedroom apartment in Tempe floor plans. Check out our five open B4 luxury apartments in Tempe today.